Getting messy with it: good day Mrs Sunshine! So today my baby boy turned one. In a strange biological anomaly, this anniversary appears to have come around in significantly less than a year (I'm not sure how long it feels since he was born… four months? Six? Whatever, certainly not a year). First birthdays are always bittersweet I think, as they do mark the end of that year (supposedly) of complete baby-ness. Which this time round I have uncomplicatedly loved. 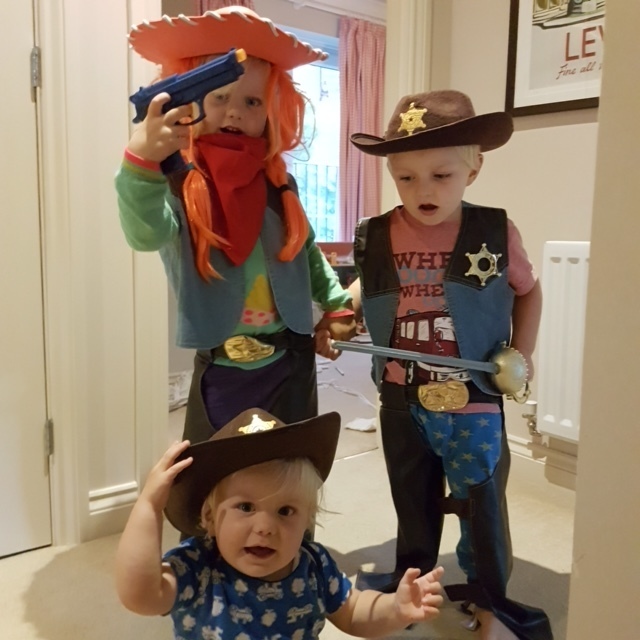 It's been a year of three children under the age of five which could have been a nightmare but was actually bloody brilliant. Kit has been a wonderful baby, and has made my life as easy as he possibly could. There was the dark period of six weeks of middle of the night pooing, and this incredibly loud roar that he whips out at teatime when he is not being fed quickly enough, or wants something off someone else's plate. There is his uncanny ability to change the settings on the washing machine and tumble dryer, whilst they are mid-spin. He has eaten a few tiny, vital pieces of lego, meaning several sets cannot be put together perfectly anymore, and buried nearly all the coins from our plastic till in the flowerbeds. But other than these small things, which have only added to the tapestry of our already chaotic lives, he has made everything better by his being here. For me, and for most people I know, having my first baby was an incredible experience which I loved but also involved a lot of sitting on the sofa in my pajamas crying and wondering what on earth I had done to my life. My husband was still going up to London every day on the train (a commute we used to do together, reading our books and chatting about our days - so civilised!) and going out for drinks with friends after work sometimes and reading the paper, and talking to grown-ups etc etc and although I loved being at home, and being with Nancy, it could be lonely and confusing and exhausting. Fast forward four years to Kit and my life had changed so completely that he just slotted straight in and further justified the brilliant chaos that is our house. Nothing was scary or unknown - in fact all the bits that had been first (and second) times round were stages that passed so quickly and I found myself actually appreciating them, knowing how soon this little human would change and grow up before my eyes. And now suddenly he is walking and clapping and deliberately doing things to make people laugh and trying to duff up his siblings and I have had to get a kitten in order to have another baby in the house! Mrs Sunshine arrived last weekend and is unbelievably sweet, bolshy and brilliant. I am still very much mourning the loss of our old, lovely, free life before the shackles of the school run. Nancy is very happy at her gorgeous village school and it is HORRIBLE!! I miss her. The boys miss her. And then she comes home from school and is exhausted and the focus is all on quiet and calm and early dinners and getting her into bed as early as possible in a vain attempt to stave off the all-encompassing tiredness that is the inevitable side-effect of this huge life change. But the kitten has provided a much appreciated focal point for cuddles and games and interest and luckily she and Nancy are firm friends already. Thank goodness for Mrs Sunshine! Sorry if this post is a bit introspective and glum sounding. We are excited about Autumn and all the loveliness that comes with it. We have been twice (once today for Kit's birthday) to the gorgeous little soft play Treehouse Café on Sussex Road in Haywards Heath, and would really recommend to anyone with pre-schoolers. It is clean and pitched perfectly at tots from crawling age to clambering (both Kit (supposedly one, as discussed) and Sam (3) absolutely loved it and spent a good hour playing very happily), which I think is the age that is quite often fobbed off at big soft plays. It does good coffee and yummy food and is actually quite a civilised place to meet a friend. Plus, lovely Discover and Be started again this week and is a treat that Sam and I look forward to at the end of the week. And Nancy, Sam and I are going to the Wigglebums/Discover and Be joint yoga/messy play event on Saturday, which we are excited about. The chance to stretch and play and be silly and messy all together sounds awesome. I think there are a few spaces left if anyone fancies it, so do contact Sheila. My book recommendation this week is easy peasy. Months ago we got Plunge into the Pirate Pool by Caryl Hart and Ed Eaves from the library and all enjoyed it so much that we have had it out again several times since. In a recent Book People flash sale, I got all six in the series (Supermarket Zoo, How to Grow a Dinosaur, Welcome to Alien School, How to Save a Superhero (my favourite), How to Catch a Dragon and How to Win a Monster Race) and they are all BRILLIANT. All about the adventures that a little boy called Albie gets up to in his imagination, with gorgeous colourful illustrations. I love them, which is lucky, as the kids ask me to read them over and over again.